If there's one area that electric vehicles still lag their combustion counterparts, it's in the distance you can travel between stops to recharge. An independent test has shown Hyundai's fuel-cell offering can cover up to 435 miles on a tank of hydrogen--significantly greater than the 265 miles of a fully-charged electric Tesla Model S.
Norwegian non-profit eco-pioneers Marius Bornstein and Arnt G. Hartvig took an example of the Hyundai ix35 Fuel Cell--the car's European moniker--from Norway's capital Oslo to Malmö in Sweden, passing via Gothenburg (Sweden) and Danish capital Copenhagen on the way. The journey took in a mix of city and highway driving, and the pair's eventual average speed was just over 47 mph over the ten-hour journey. 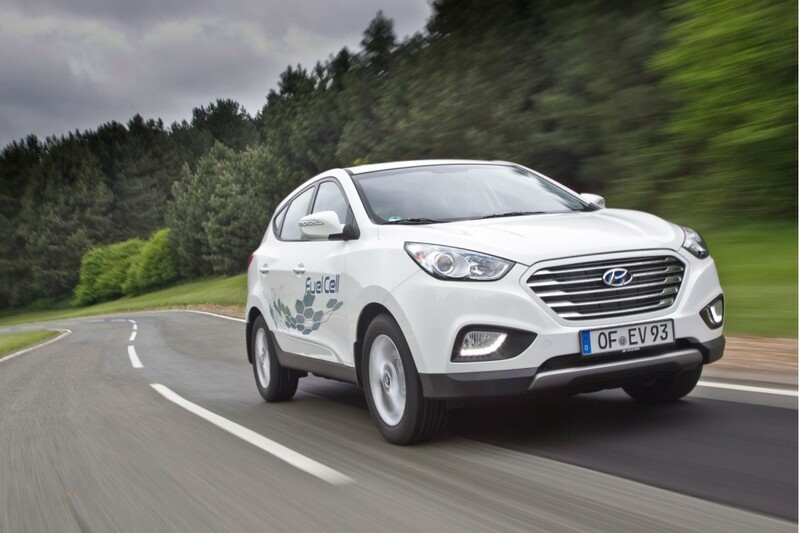 In European testing, the Tucson Fuel Cell is officially rated at 369 miles, meaning the duo beat the stated numbers despite the real-world conditions. Bornstein said the pair had originally planned to stop in Copenhagen, but realized the car was capable of going even further. "To achieve this distance on just one tank of hydrogen shows the potential of this technology and the ability of the Hyundai ix35 Fuel Cell" he said after completing the drive. "I believe this is a world record." It isn't the first time Bornstein and Hartvig have completed a long-distance trip in the Tucson Fuel Cell. In 2012, the duo took a pre-production version of the car over 1,400 miles from Oslo to Monaco, albeit stopping to fill up on the way--demonstrating Europe's refueling infrastructure at the time. Hyundai says the long distance drive demonstrates the viability of hydrogen power on the road, and that the company will continue to promote a hydrogen refueling network across Europe. The South Korean company has been researching hydrogen vehicles since 1998. The Tucson Fuel Cell is the first production hydrogen vehicle the company has put on the streets, and is already filtering down to customers in California. While many battery-electric vehicle drivers have found their cars capable of meeting daily range needs, longer-distance vehicles are still important, particularly for the manufacturers themselves. As we revealed yesterday, automakers get higher zero-emission credit points for a 300-mile fuel-cell vehicle than they do a 100-mile electric car--so expect to see many more of them over the coming years.